In the process of researching for a post I’m planning on companion planting I came across a great information resource at the website of the University of Tennessee, Institute of Agriculture website. They aren’t dealing solely with permaculture or organic farming, but much of the material is very relevant to those approaches. I’ve edited the list of topics that their website links to, to make it a bit more relevant, but when you click on any one of the links below it will put you into their whole list of topics, so you can wander through it as you wish. I just spent a morning putting together a batch of compost. Four hours of solid work, from getting the green waste that is the basis if this batch to capping it off with a fluffy cap of straw. 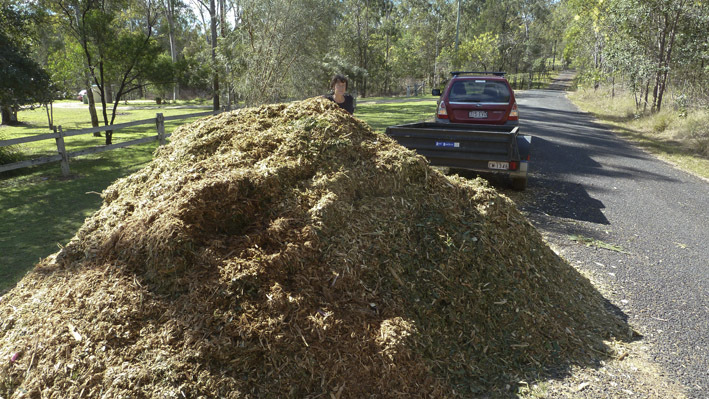 The green waste came from a vegetable packing shed, where I had to line up with all the farm utes picking up a load of cattle feed (we’re in a drought, despite the reasonably good rain in the last couple of weeks). When you think about it, these farm animals are eating better than those of us who shop at supermarkets. 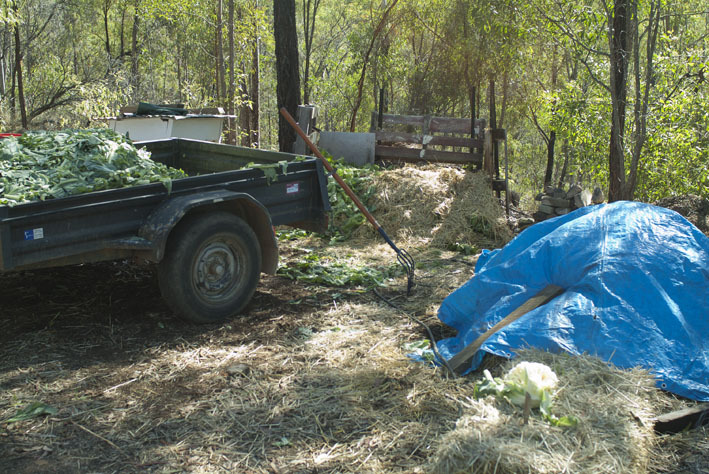 Picking of the vegetables commences early in the morning, and the green waste starts coming out of the packing shed around 7.30am. 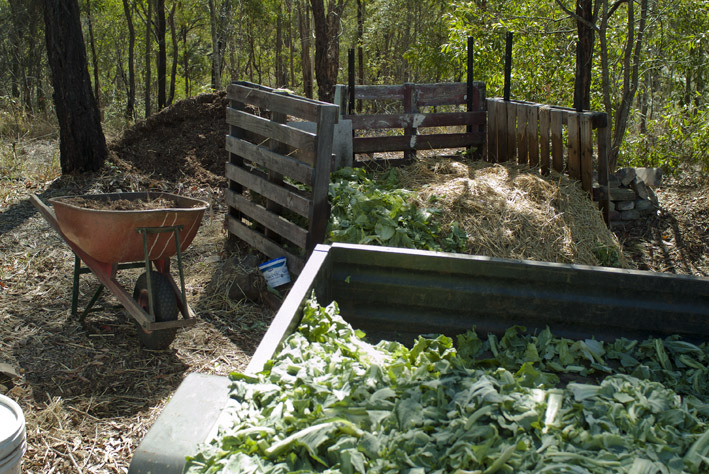 There might be a bit of waste from the previous afternoon in the first few bins, but from then on it is all stuff that has been picked on the same day – and goes straight from there to the farm or, in my case, straight to the composting organisms. If you buy vegetables from the supermarket they have gone from the field to the packing shed, to the market or to the supermarket chain distribution centre, generally on the same day, and from there to the supermarket – you will be getting it two or three days after it was picked if you are lucky. I have a friend who works in a packing shed who takes pride in the work she does to select, trim and pack the vegetables she works on. When she sees the same vegetables in the local branch of the supermarket her shed supplies her feelings are frequently somewhere between outrage and insult because of the difference in quality she sees compared to when it left her hands. Anyway, back to the green waste. Lettuce and cauliflower trimmings today, with a bit of broccoli. Two bins are tipped into my trailer by the forklift operator, and I quickly move aside to park and cover my load so others can be served. Back home, reverse the trailer up to the compost production bins (not easy to do in the tight space between stockpiles of horse manure, poultry manure, chipped tree loppings, chip mulch from our firebreak clearing, and sand/silt from the drains on our two kilometres of access track, as well as the last batch of compost. Set up the water pump and hoses and get out the tools. The first layer is already in the compost bin: about 20cm of chip mulch from a tree I had to cut out of the firebreak, covered by a layer of the coarse compost materials from the last batch. It’s been lying there under a layer of straw for a week or two, and with the rain we’ve had the composting process in the chip mulch is probably well started. A thick layer of green waste goes on top of that, then a layer of chipped tree loppings that has been stockpiled since last July and is just starting to get fungal strands through the lower parts of the heap. The mountain of chipped tree loppings from under the power lines. We shared it with one of our neighbours and still got eight trailer loads – a full day’s work to move it all. 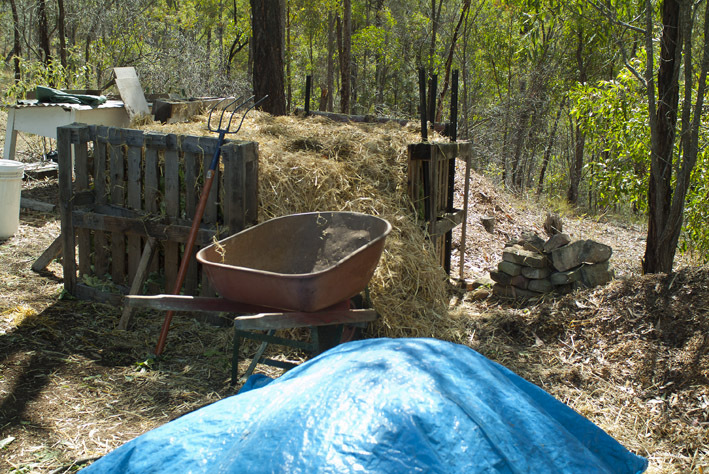 I wet that layer thoroughly, before adding more green waste and then a layer of decomposing barley straw from a spoiled bale that I’d put behind the compost bin a while back. That’s wetted down too. More greenwaste and then a layer of months-old broiler droppings. In truth, the broiler droppings were always more wood shavings than manure, with a good dash of spilled feed and water, but now they look decidedly woody. I’m kind of wary of broiler droppings because of the short time the birds are on it, leading to a poor ratio of wood to manure, and not much breaking down of the woody material before I get it. This weathered stuff looks like 80% wood shavings, but I notice that a lot of the woody material is quite soft, and is in a matrix of very fine dark, damp material that might already be compost. Nevertheless, if I was really intent on making 18-day compost I wouldn’t use broiler droppings, weathered or not. But I’m not a great fan of the strict 18-day process. In my experience after 18 days the result can look like compost, but it never smells like it – you know that rich, earthy, good-compost smell? Doesn’t happen for me in 18 days, even when temperatures and moisture content are all perfectly aligned. I wonder how often it happens for others. What I have seen is that the longer an 18-day compost is left to “mature” the better it gets, with more life in it, and generally after three weeks or so of maturing it suddenly gets that earthy smell like forest litter. From then on it just gets better still, and eventually (if I leave it long enough) has a network of fungal hyphae extending through it. Not that I always leave it to the fungal stage, and at times I start harvesting the finest sieved component before it smells right, if I’m desperate to make some potting mix or a seedling bed. Back to today’s compost. From there on it’s just a repetition of the same layers and watering, until the green waste load is used up and the compost bin is full. Then it’s topped off with a thick layer of fluffed up barley straw (to keep it the sun off it while allowing air circulation) and I get out an old tarp to leave beside the bin in case I see heavy rain coming. Just to make me feel good I measure the dimensions of the heap and take a final photo. Volume of the heap: 2.28 cubic metres. 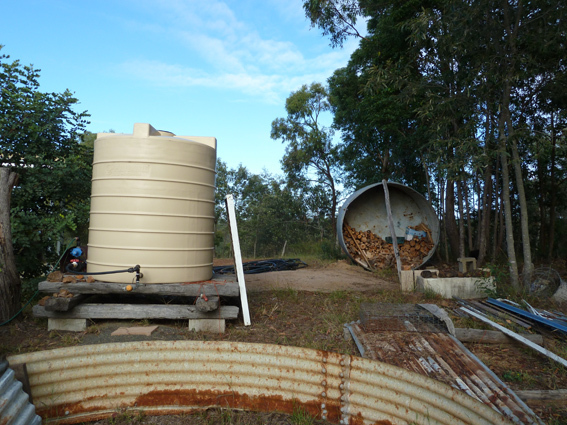 That will drop quickly in the next couple of weeks as the heap settles and water is driven out of the lettuce and cauliflower waste, but it should produce at least 1.5 cubic metres of good compost. Finally I make a note of the date and give the heap a code on the whiteboard in the workshop, where I will record the temperature of the heap from time to time. What I want to see is that it gets into the 50-65 degC range for at least a few days, and that it doesn’t go into the 75+ degC region for more than a short period, otherwise I’ll have to turn the heap at that stage to drop the temperature. Then, once it has done about a week in the 50-65 range I’ll turn it when it’s convenient. After that, once it drops to around 40 degC (not lower) I’ll turn in every few days to a week, making adjustments to water content and the time between turnings to try to keep it above 40 for two or three weeks. After that I’ll make sure the last turning has moved it to a place where it won’t be in the way of the next batch or other work, and just keep an eye on it’s progress and of course, the smell. By the way, do you see the fork in the last photo? That’s a manure fork, with four tines rather than the three in a pitch (hay) fork. The tines in the manure fork are closer together, and they are fatter as well as having a bend (or a significant curve) so it’s easier to push them under things on the ground. 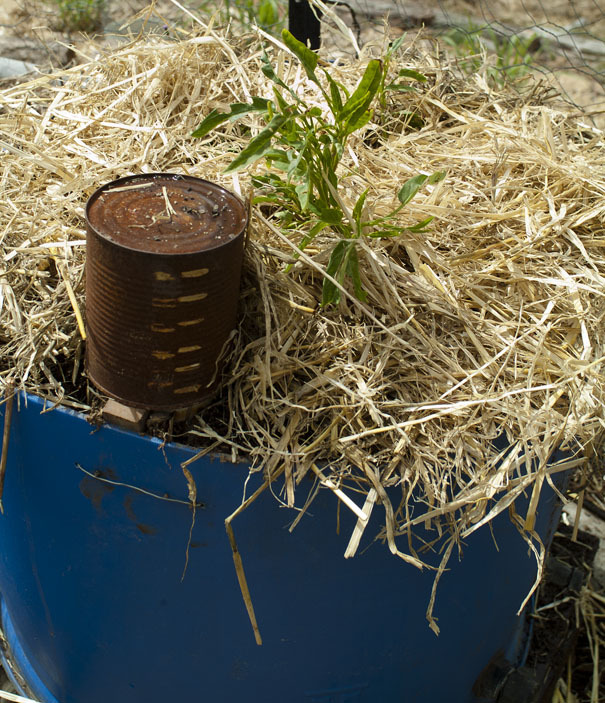 Pitchforks are all very well for throwing sheaves of hay onto haystacks, but I find that they don’t pick up the shorter, looser material like compost ingredients or manure very well. And they’ve (finally) started to become available in Southeast Queensland – at Mitre10 and Trade Tools if you’re looking for one. It’s difficult to get a good idea of the level of real wastage in the fruit and vegetable production system. A Bush Telegraph episode on ABC Radio National on 14 July gave a figure of “$10 billion worth of food” wasted annually by “Australians”, but this isn’t broken down beyond “food”. Later in the same article they quote figures of “between 20 and 40 per cent of fruit and vegetables grown” being rejected before they reach the shops “because they don’t meet supermarkets’ high cosmetic standards and specifications”. However I suspect that there are different rates for fruit and vegetables going to landfill. For example, any fruit with large seeds (avocados) would be unsuitable for stock food, for instance, as are whole potatoes, because of the risk of choking. Apart from what is diverted to stock food at the farm or packing shed, some of the “unsuitable” fruit and veg goes to charities for distribution to low income families. What I’m not sure about is whether fruit and vegetables grown under contract to the big supermarkets is prohibited from being sold as a condition of contract. I’ve heard this said, but haven’t been able to find any evidence one way or the other. It would be interesting to know. It would also be very interesting to see a detailed breakdown of the different destinations for rejected fruit and veges. 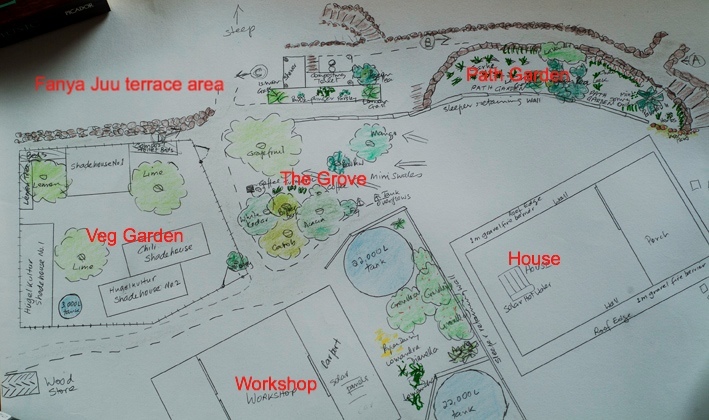 In this post I’m going to give you an overview of the food garden areas, with a few “before & after” progress shots – starting with this shot of our first garden (it’s roughly where the porch is now on the plan below – middle right edge). First garden, 4 November 2006, in a section of an old tank. Eventually we had three tank sections in a clover-leaf garden. We were living in the shed at the back, which is now our office, TV room, library, etc. 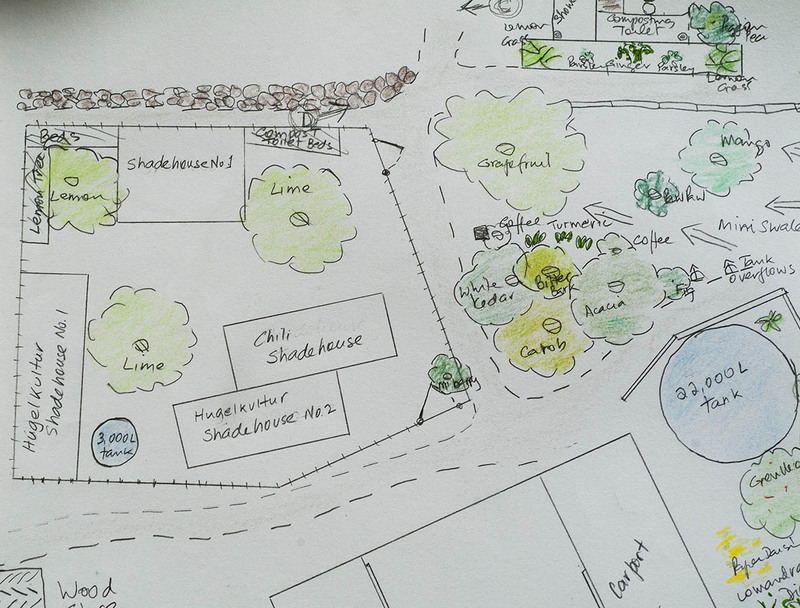 Our current main food growing areas are: the Veg Garden, The Grove, and the Path Garden (left to right on the map above). North is slightly left of up (the house is pretty much E-W), and for a scale, the widest (E-W) dimension of the Veg Garden is 13m and it is 11m N-S. The area from the house to the Path Garden is more or less flat, but then drops away steeply, so the Path Garden is sort of a terrace. Anything we grow in the Path Garden must be either unappetising to the wildlife or secure behind some kind of barrier – hence the collar on the paw paw tree and the net tunnel over the sweet potatoes. 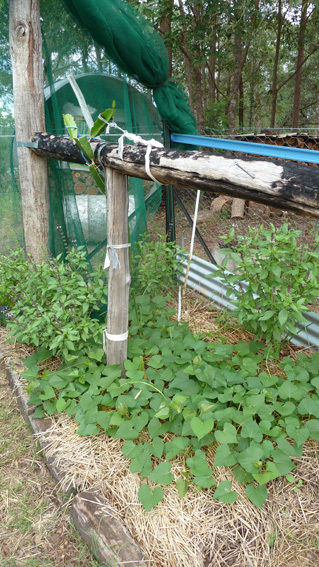 The sweet potatoes were growing in an area of around two square metres, though the foliage spreads much further, and yielded 9.5kg despite months of dry weather. The Grove is a small area that we never planned to become part of our productive garden. It had a Carob tree, and an unidentifiable citrus tree when we arrived. The citrus didn’t even flower for about 10 years, then when we pruned it one wet year it suddenly burst into flower and yielded 70 pomelo/grapefruit type fruit – absolutely delicious. When I was plumbing in the water tanks for the house I decided to run their overflows into a series of mini-swales that drain into and through The Grove. Friends gave us a couple of Coffee bushes, so we needed a shady place for them and The Grove seemed just right, and they’ve thrived ever since. Now they’ve been joined by Turmeric and a Mango tree. No time to go into the details of Fanya Juu terracing now (a later blog post) but here’s the area where they are being developed. This was taken from photo point C in the map above. I always regarded this area as too steep to do anything with, even though it has a really good aspect, but when I came across Fanya Juu terracing I decided to give it a go. It’s a long way from complete, and doesn’t get very high priority, but whenever I feel like a bit of a work-out I dig some more swale or haul more rocks for the terrace wall. 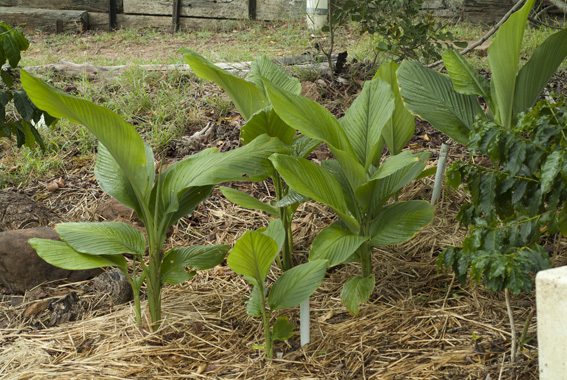 That’s Queensland Arrowroot growing on the terrace – a great potato substitute requiring very little care and attention. OK, now let’s go into the Veg Garden. This area was totally unplanned from the outset. When the house construction started we were suddenly faced with the problem of disposing of the spoil from the foundation excavation, so some of it was dumped here. Then came the problem of what to do with the Lime and Lemon trees that were in the way. No time to think about it, so the back-hoe operator dug them up one at a time and carried them in the bucket to this area, dug a new hole and “planted” them. They thrived! And that gave us the “constraints” for later planning of shadehouse locations. You can see Shadehouse No.1 in the photo above of the Fanya Juu location – it’s an old temporary carport someone gave us when the cover had perished. Here’s another view from in The Grove. Here’s the location of the next shadehouse as it was in June 2010. The tank IS vertical – the photographer wasn’t. The First Hugelkultur Shadehouse was constructed about where the sheet of iron is to the right of the tank. That’s our firewood store at the back. Making an above ground mound of wood and covering it with soil in typical hugelkultur style would result in a very dry bed in our climate, so we dug the base out 300mm deep (about 1 foot), and filled it with old wood, branches, leaves, poultry manure and chip mulch. 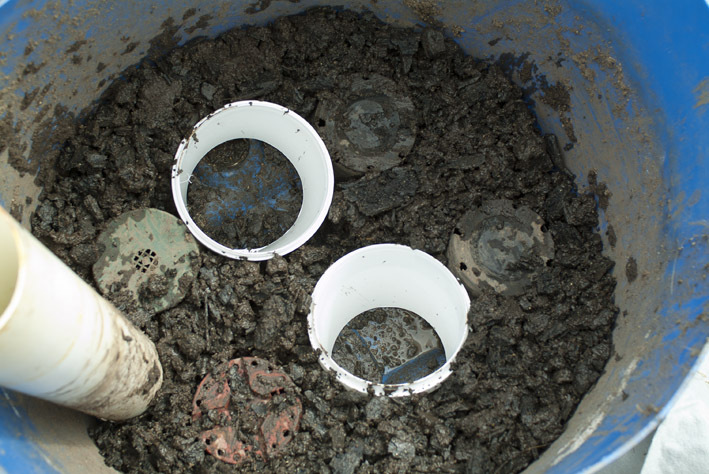 Then the rocks were sieved out of the soil that had been removed and it was put on top of the base in alternating layers with straw and poultry manure. We did about two metres of the floor of this shadehouse in October 2012 as a trial. This is what the first crop of Sweet Potato and Thai Basil looked like – with a young Dragon Fruit just peeking over the log trellis. 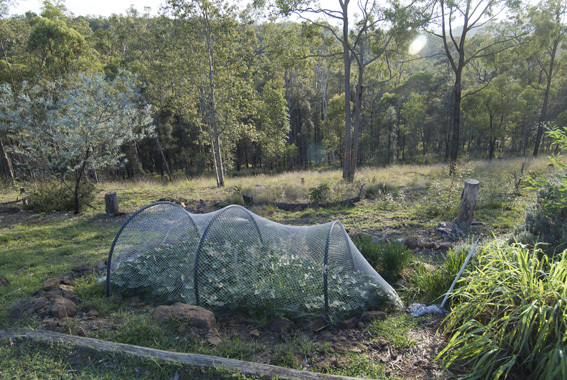 The plants in this area remained green while others in the garden were drooping from lack of water, so we decided to extend the hugelkultur treatment for the full (5m) length of this shadehouse. 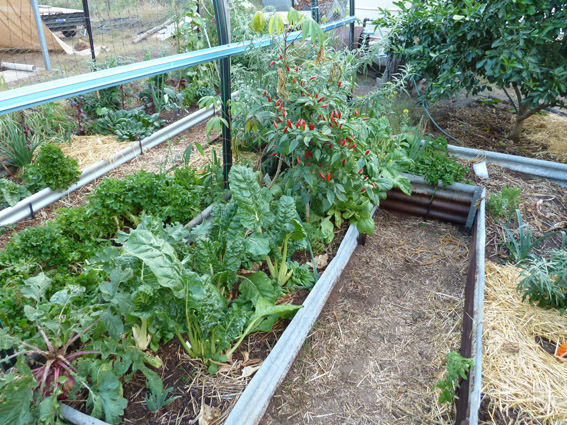 It has been very successful, with continued “drought resistance” and crops of Kale, Gai Laan, Silverbeet, Ginger, Dragon Fruit, Baby Broccoli, Flat-leaf Parsley and Radish. After 18 months the soil level has dropped by up to 200mm in places, presumably as a result of the rotting of the wood underneath (that’s what is supposed to happen), so I’ll be topping it up with fresh soil in the next couple of months. 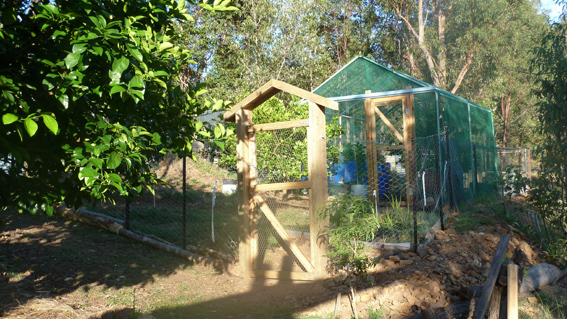 Our success with this approach inspired us to try it again with Hugelkultur Shadehouse No.2. This has been even more productive than No.1, if that is possible. 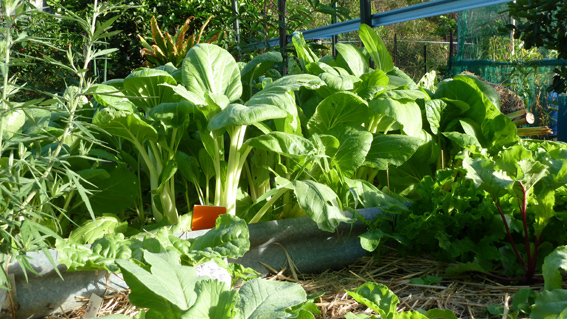 In this photo there are: Loose-leaf Lettuce, Aibika, Spring Onions, Bok Choy, Brazillian Spinach, Cassava, Cherry Tomato, Ceylon Spinach, Tat Soi, Sugar Snap Peas, Clumping Leek, Amaranth, Mugwort and Perpetual Coriander. After the massive effort in digging out two shadehouse bases, each five metres long and two metres wide, I thought it might be time to try some simple raised beds. The Chili Shadehouse is “grafted” onto the previous shadehouse because space in the enclosed Veg Garden is now in short supply. Its raised beds are sitting on rocky fill, and the “soil” is all “manufactured” because, as you are probably starting to gather by now, we don’t have much actual soil on top of the ridge. Or anywhere else on the property for that matter. 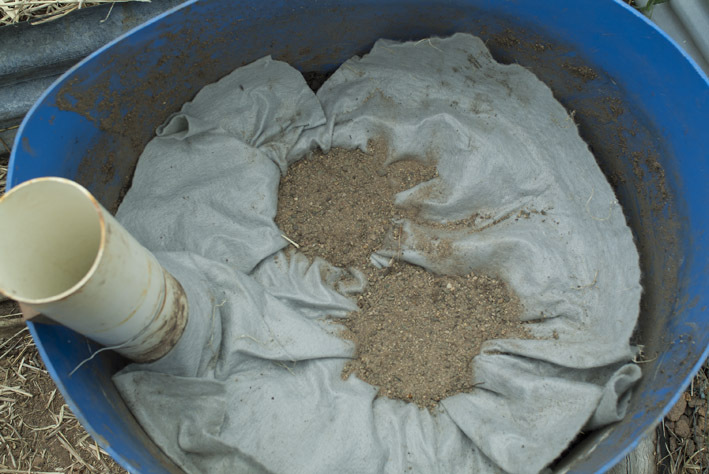 The recipe for the soil is: 9 parts of sand and silt out of the drainage gutters on our access track; 3-4 parts of fine sieved compost; and 3 parts of chipped matured horse manure. It makes a rich, well drained but water absorbent, “fluffy” loam. This gives some idea of how productive this shadehouse has been. 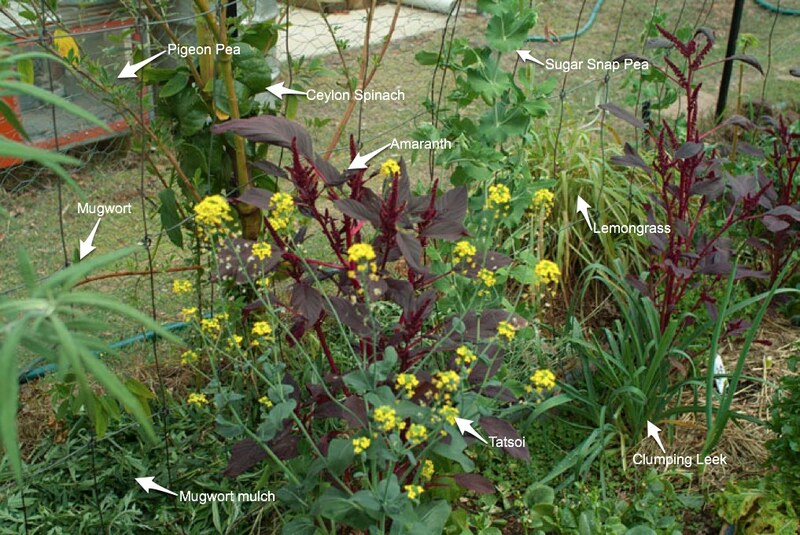 There are Radish (left to go to seed), Silverbeet, Corn Salad, Chili (growing madly, hence the name of the shadehouse), Pak Choy, Curly Parsley, Brazillian Spinach, Greek Basil, Clumping Leek, Mugwort, Cassava and Aibika. A month or so before this photo I’d harvested Turmeric and Kipfler Potatoes from the empty areas you can see on the right of the above photo. And, finally, these are the beds across the front of the Chili Shadehouse. In late May this year these two beds had Bok Choy, Pak Choy, Beetroot, Silverbeet, Radish, Corn Salad and Loose-leaf Lettuce. With the exception of the Silverbeet that has all been harvested and I’m about to start Spring planting in these beds. 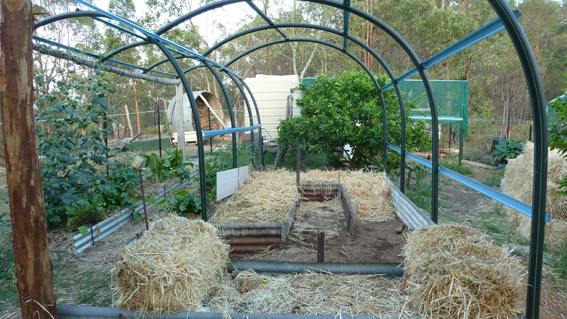 I’ve left out the Lemon Tree Fence Beds and the Composting Toilet Beds (I’ll leave the explanation of that name till another time). I hope you’ve enjoyed the tour. 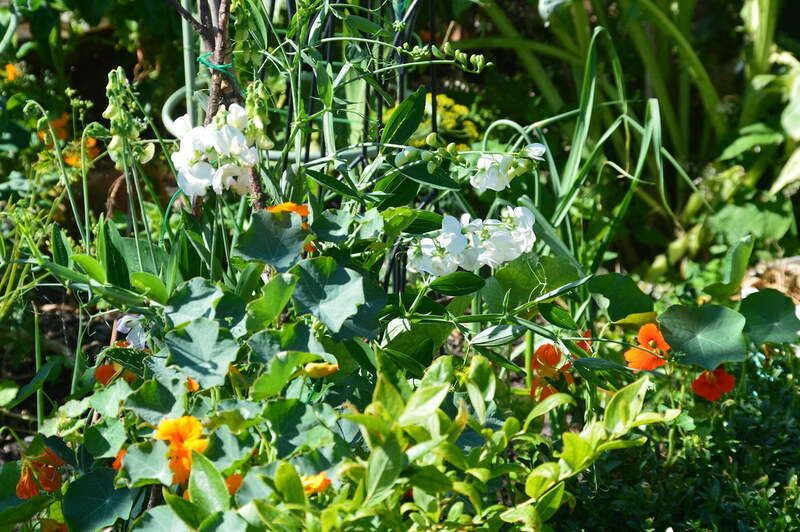 I’ve just been reading a post by Tom at Sustainable Veg with the intriguing title: A Forest Garden Without the Forest. It first caught my eye because of my scepticism about permaculture “food forests” as an efficient use of land for producing our daily meals. I’m not talking about the food forests that surround hamlets and households in Southeast Asia and other parts of the world. I’ve had a lot of contact with these, and in general these food forests are fruit, leaf and herb production areas, often with some poultry, and which also provide shade to cool the area around the house. Their production supplements the range of day-to-day basic foods from more distant wet or dry rice areas or upland gardens. 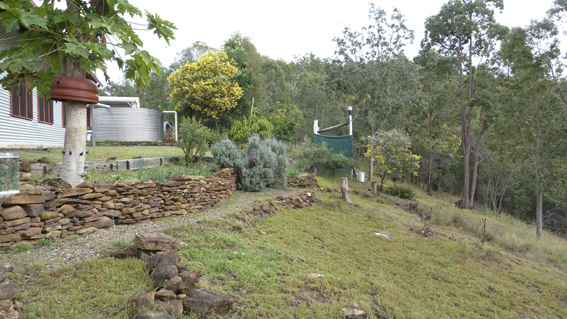 My scepticism relates to the tendency of many permaculture followers to focus the majority of their production efforts on food forests dominated by fruit trees of one type or another. 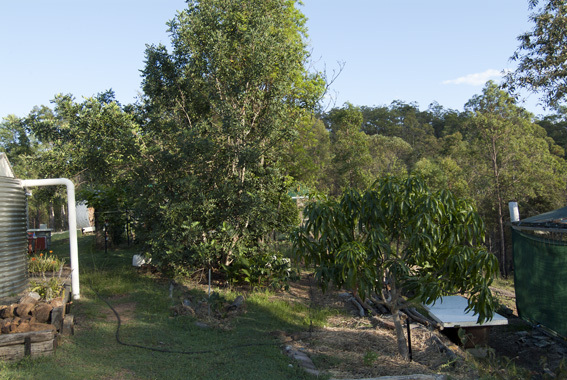 And there seems to be a common belief that if it doesn’t have a food forest, then it isn’t permaculture. 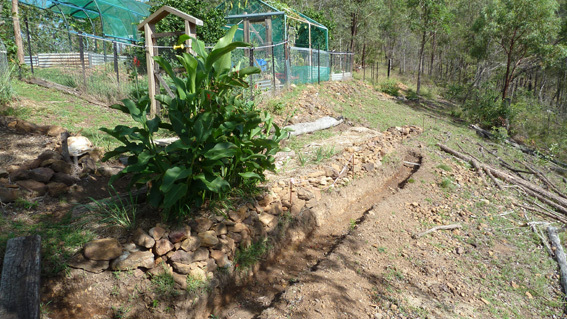 Permies coming into a new garden will frequently ask “where’s your food forest?”. 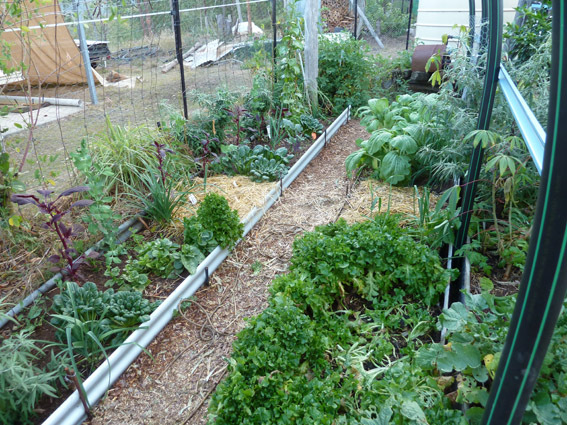 Of course, many people with food forests also have “kitchen gardens”, but even so, there is often a serious over-allocation of area and effort to the food forest, out of all proportion to the negligible volume of “staples” produced there and the generally low productivity per unit area. As Tom says in another post: “Billions of people need feeding … (w)e can be an alternative, organic movement but we need to produce carbohydrate, protein and vitamin dense food, in large amounts…” (I’m not suggesting here that Tom shares my views on food forests – to be honest, I don’t know). Tom’s describes his back garden (he also has an allotment) as “a productive, organic, kitchen garden with substantial amounts of perennial vegetables, some annual vegetables and five dwarfing fruit trees”. But he also calls it a forest garden, and refers to his techniques as forest gardening, and for good reason. Vertical stacking, with three diverse layers of plants, in association with individual fruit trees. The use of support plants, with half the area of his garden devoted to these, but with the difference that he composts the prunings from the support plants before putting it around the food plants. In this way he can focus on the needs of the support plants in one area and those of the food plants in another. I also suspect, from what he writes and from the photos in his gallery (including the one above), that many of the things growing in his food production area are supporting each other. 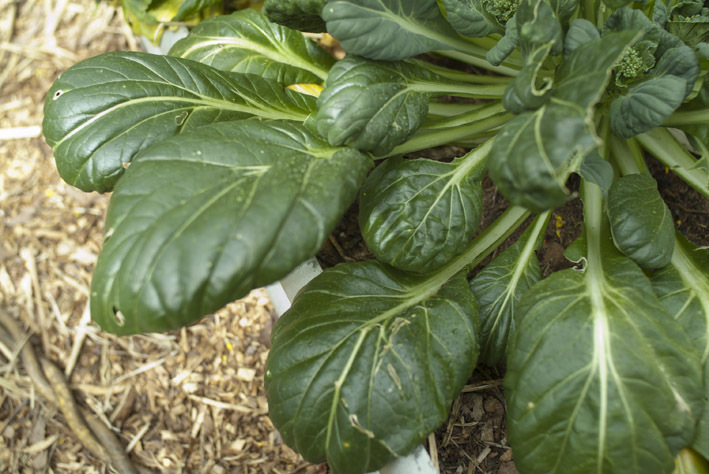 Growing a wide range of perennial vegetables. Adopting a “closed loop fertility” approach whereby he grows all of the ingredients for the compost on his own land. You can see a separate post on it here. I find this an admirable but daunting prospect. I certainly wish I could imagine getting to that stage on our stony dry ridge. 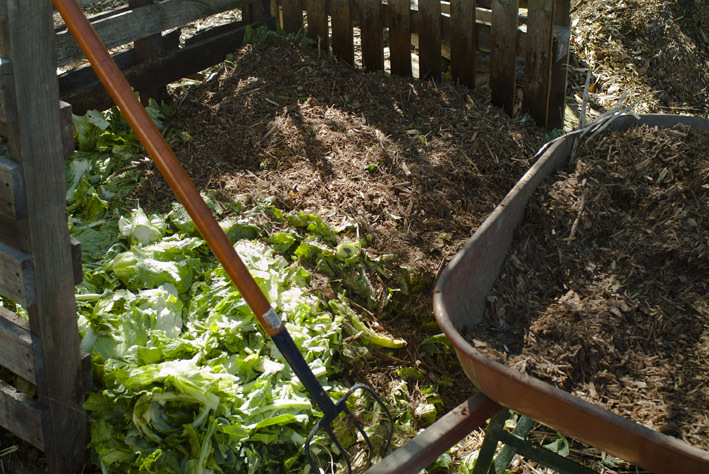 At the moment the bulk of our compost ingredients come from off-site (but within 10km). Please do yourself a favour and read Tom’s article for yourself. What Tom has done is to apply the key food forest approaches without having his productive area dominated by forest. I’m in awe of what he’s doing and the strong ethical approach he takes, and I’ll be adopting some of his approaches as I develop and expand our food production area. 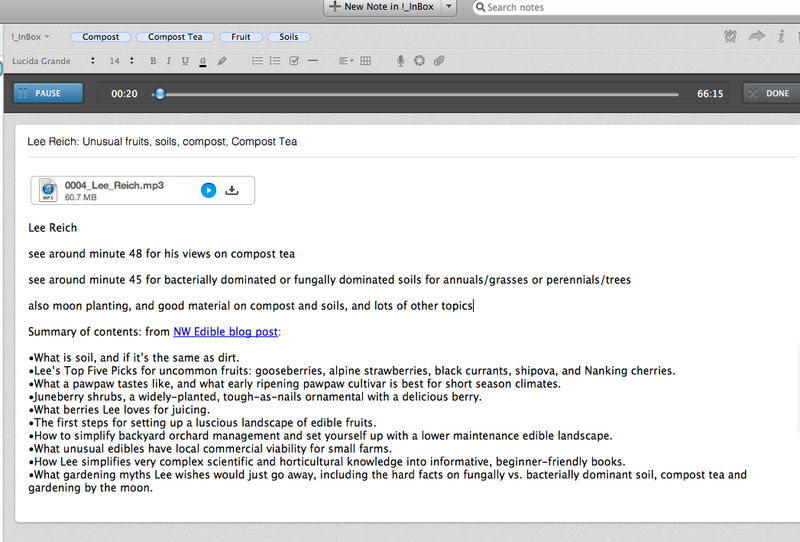 As I finished writing this I noticed that Tom has added a post about compost which gives more insights into his approaches. Enjoy. Just a quick one to alert you to a very interesting new podcast on the Northwest Edible Life blog featuring an interview with Lee Reich. Reich has graduate degrees in soil science and horticulture and has worked in plant and soil research with the USDA and Cornell University, before turning to writing, lecturing, and consulting. He has written at least nine books as well as running an interesting blog. Because of his educational, research and practical experience in two fields which are an important part of the basis of permaculture, a lot of what he says in this interview will be of interest. Erica, the host of the Northwest Edible Life blog, has a lively and easy to listen to interviewing style that keeps the flow of ideas coming throughout the interview. You can also download the podcast – which leads me to the topic of mp3 player programs. I’ve found a lot of the programs available for Macs to be a bit of a pain in the neck – and I totally refuse to use iTunes because like a lot of Apple’s market oriented software it is just too focussed on data collection. Then I just stumbled on the fact that if I stored an mp3 file in Evernote I could also keep comments about the content of the podcast in the same in the same Note, as well as using Evenote’s very functional mp3 player straight from the note. In fact what I do is to store the file in my General Library folder, along with pdfs etc, then link an Evernote Note to that file. Evernote is available for Mac Windows phones and tablets. I recommend it as a great place to dump information that will be useful one day, or to keep copies of receipts (e.g. for equipment with a warranty), warranties, manuals, etc. My only problem with it is that it can be difficult to extract files from Evernote once they are saved into a Note, but I get around that by “attaching” files to Notes (and by keeping most of my technical notes in Devonthink Pro Office). Is it possible to grow vegetables using no-till farming? At various workshops and meetings I’ve often heard statements along the lines of “no-till approaches are all very well for broadacre cropping (e.g. grain crops), but no one uses them for vegetables” – to the point where I just assumed that there must be good reasons for not doing it. Can it even be done, even if only by dedicated permaculturists willing to put in huge amounts of effort? Well, yes it can, but not just through huge amounts of manual labour and on a small scale. There are people our there successfully doing mechanised no-till vegetable production. This article by Dr Mark Schonbeck on the Rodale Institute’s website tells the story. 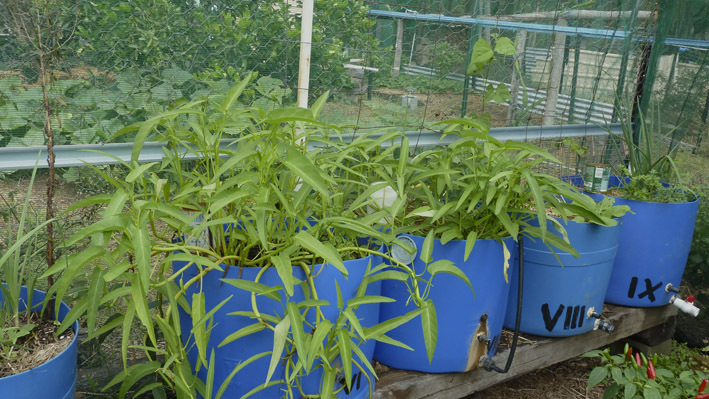 According to the article, Dr. Ron Morse, a professor of horticulture at Virginia Tech, in Blacksburg, Virginia has been working for more than two decades on soil-conserving systems for vegetable production. This parallels efforts by Pennsylvania vegetable grower Steve Groff (in an article by Marni Katz) over the same period on his Cedar Meadow farm. The permanent cover cropping system that he has developed helped to eliminate tillage on 175 acres of pumpkins, tomatoes, sweet corn and other vegetable crops on his Cedar Meadow Farm. Not only has this approach reduced cultivation costs and improved yields and quality, it has also helped manage the soil erosion from the farm’s sloping topography. 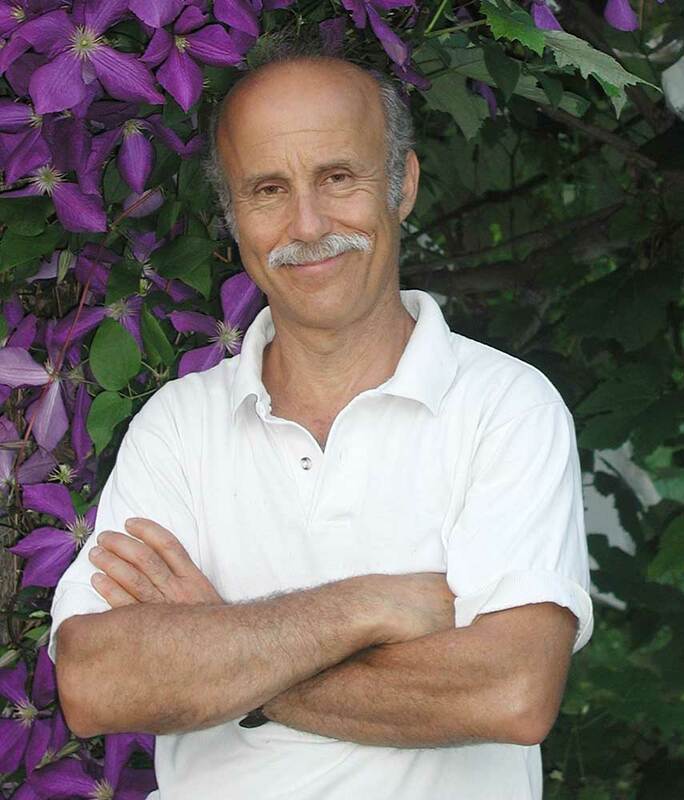 You can find a list of other articles about Steve Groff’s farm here. Ron Morse (1999#) has attributed the progress and acceptance of no-till vegetable production in the US to advances in no-till planters, development of techniques for managing high residue cover crop mulches and the acceptance of (and improvements to) integrated weed management techniques. However I think there are a lot of other factors involved, including: farmer attitudes to the “bottom line”, i.e. whether they are mainly profit-focussed or have an eye on the triple bottom line; farmers’ willingness to be different to their peers (i.e. operating outside the norm); and ability and willingness to deal with a different suite of pest problems arising from the use of cover crops. 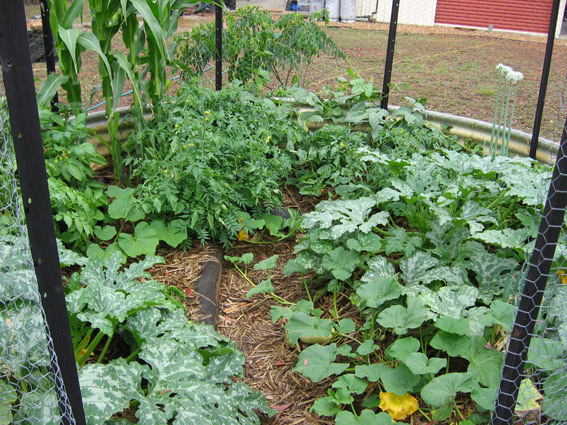 No-till vegetable farming has been practised in Australia for around 20 years (e.g. Rogers et al. 2004#), but does not seem to have caught on widely. 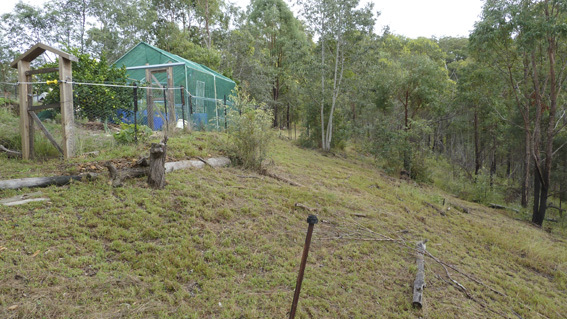 However there was a study of seven trial sites at different latitudes in Australia (including one at Zeibarth’s farm at Laidley in the Lockyer Valley), published in 2006, that also reviewed a range of studies on the application of the approach in Australia. Unfortunately it seems from a quick reading of the report that glyphosate was used to kill the cover crops at most if not all of the sites. However, the report does include an assessment of the use of a combination of Organic Interceptor (a certified organic acceptable herbicide) and flame treatment, but concluded that only glyphosate gave acceptable long-term weed control – though clearly there are farmers in the other articles that I’ve provided links to here who are able to deal with this issue. You can find a balanced and fairly comprehensive evaluation of the organic no-till approach here and here, providing you with a pretty comprehensive range of considerations to bear in mind when deciding whether to attempt an organic no-till approach to growing vegetables. “… for the grower who does his homework, the no-till system offers significant advantages. No-till growers typically save money by reducing water use in irrigated systems, reducing cultivation equipment and fuel costs and minimizing inputs, such as herbicides and fertilizers. In addition, Katz quotes Ron Morse who pointed out that growers often realize increased yields through soil moisture conservation and enhanced quality, particularly for crops that lay on the ground. At the same time, there are increased costs in equipment and seed for managing the cover crop. # Morse, Ronald D. “No-till vegetable production—its time is now.” HortTechnology 9.3 (1999): 373-379.